With a stay at Joy Family Lodge in Amasaman, you'll be 6.8 mi (10.9 km) from Achimota Mall and 9.6 mi (15.4 km) from Wheel Story House. Featured amenities include a 24-hour front desk, luggage storage, and laundry facilities. A roundtrip airport shuttle is provided for a surcharge (available 24 hours), and free self parking is available onsite. 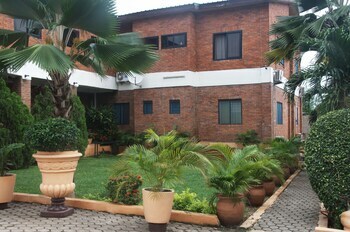 Kangaroo Beach Resort Hotel is located on the grounds of the pristine Busua beach in Ghaneans Western Region.